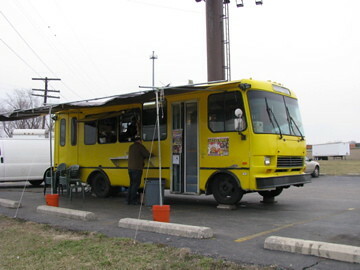 Super Torta II is in one of the larger trucks we’ve come across (it looks to be a renovated RV). This, perhaps, accounts for it’s relatively broad menu featuring interesting offerings such as esquites (corn soup with mayo and cheese), tlayudas (a huge tostada-like dish topped with generous slabs of chicken and steak), flan, and snack bags filled with what was described as ‘something similar to fried pasta’. 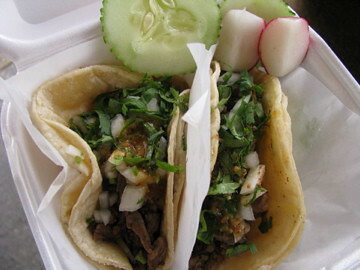 Of course, all of the usual offerings were present as well, and the tacos we tried were very good. Just tried it out today! At Super Torta we ordered two tacos (one adobada and one pollo) and a mandarina jarritos. Super deal at only $1.25 per taco and another $1.50 for the 20 oz drink. Good $4 lunch option for anyone on the west side. The tacos were of the simple meat, onion, cilantro variety with sides of cucumber, radish, and lime. Everything was very fresh, but without any sort of salsa it was a bit dry. Despite the dryness, the pork was pretty tasty, but Anne said the chicken didn’t seem to have any sort of seasoning added at all. The drink was great though! Can’t recall the last time I’ve drank a carbonated beverage that was made with sugar instead of HFCS. The taste is so much different. I don’t have a pic, but have had their tortas. They are on bolillos, as they should be. The toppings, however, are kinda bizarre. Any torta you order has salcichas and eggs with chorizo. I had a cubana and it had milanesa, chicken, salchichas, jamon, the huevos/chorizo. 5 meats but no cheese! To each his own. 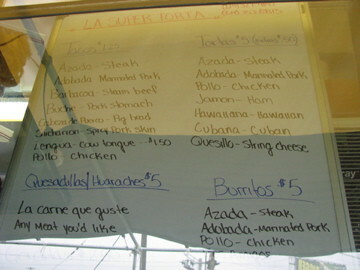 I prefer the tortas from Las Delicias or La Michoacana (N. Sawmill) that stick to mayo, beans,meat, chiles, cheese, etc. A torta is anything inside a bolillo bread, there is not an specific recipe. Tortas in mexico are very common (maybe as much as tacos). There can be anything inside them an their styles may vary according to the region of mexico the person preparing them is from. tried carnitas, asada and pastor tacos. i liked the carnitas the best, though all were pretty good. while was there, three fairly hefty amigos were working on several plates of varied tacos, sopas, a burrito and other unidentifiable comidas. once full, they offered me their untouched pastor tacos. muchas gracias, what a deal! the meats were light on seasoning, but a good dosage of the salsas fired things right up! recommended! Love the barbacoa tacos here. Still not open though…. They are due to open again this week. yesterday they were down at Rhodes Park. They delayed their spring opening due to the rainy weather.